A Los Angeles-based company that has a North Dakota office in Fargo, CBRE, is partnering with Kilbourne Group to help market and manage lease space in the 125,000-square-foot Black Building in downtown Fargo, which is undergoing a renovation. Chance Lindsey, who works in CBRE’s North Dakota office, will handle leasing duties involving the Black Building, which will have fully renovated office space available starting in April, according to information provided by CBRE. Eric Christensen, who is with CBRE’s asset services division and works out of Fargo, will manage the building on behalf of Kilbourne Group, which purchased the Black Building at 118 Broadway in 2015. The art-deco building, with a cornerstone placed in November 1930, was added to the National Register of Historic Places in 2016. The renovation work included infrastructure upgrades as well as renewal of historic designs and materials. 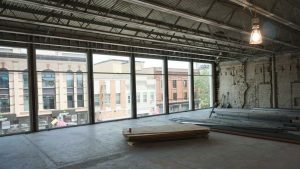 In addition, the eight-story building will feature a rooftop patio two floors above Broadway and one full floor is devoted to executive suites that share a breakroom as well as a conference room that can be reserved. With more than 70,000 employees, CBRE Group is one of the world’s largest commercial real estate services and investment firms. Kilbourne Group was founded in 2006 to serve as a catalyst for revitalizing downtown Fargo. Today, Kilbourne Group describes downtown Fargo as a thriving retail district with more than 300 stores, more than 2,400 apartments, and more than 2 million square feet of office space.